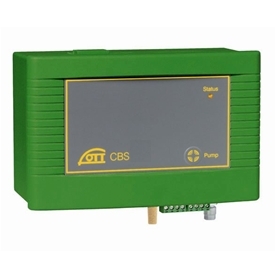 The OTT CBS uses the drift-free measuring principle and covers a measurement range of up to 30m. An integrated compact piston pump produces bubbling pressure for the indirect measuring principle. Through a connected measuring tube the compressed air will be blown out in the water via a bubble pot. After the process of blowing the pressure between the measuring tube and the water pressure at the bubble pot is equalised. A pressure measuring cell in OTT CBS measures the air pressure and the prevailing measuring tube pressure successively. 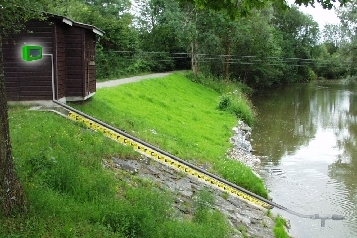 By taking the difference between both signals the exact water level will be calculated compensated by drift. The measuring results can be transmitted via SDI-12 interface or a 4...20 mA analog signal. The measurement and pumping procedures is carried out at adjustable measuring intervals. After a measurement the OTT CBS is being switched off automatically until the next measurement cycle (standby mode). No software for the set-up is needed. Via DIP-switches the necessary settings can be done. Using an intelligent pumping strategy the OTT CBS doses the exact amount of air required to guarantee precise measurements and to reduce condensation. The standard version allows a water level measurement of up to 15 m. An advanced version with air drying unit and an extended calibration allows measurements of up to 30 m.
For special applications a version with ±1.5 mm accuracy in the first 3 m of the 15 m range is available. Connection of pressure tubes with different inner diameters possible (2 mm, 4 mm, 1/8"). Existing 4mm standard pneumatic measuring tubes can be used as well.